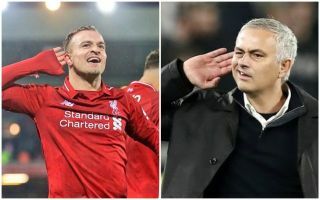 This went somewhat unnoticed during the game, but it looks like Xherdan Shaqiri may have taken a deliberate little dig at Jose Mourinho after celebrating his goal for Liverpool vs Manchester United. The Switzerland international can be seen in the photo below putting his hand to his ear and squinting rather like Mourinho recently did when his United side won 2-1 away at Juventus. That seems like a very long time ago now as the Red Devils’ form has gone from bad to worse, but it seems Shaqiri remembered it – and didn’t miss his opportunity to troll the Portuguese!